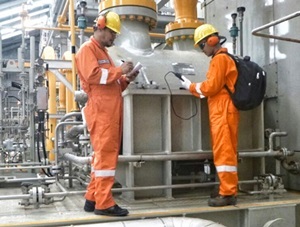 PT Energy Management Indonesia (Persero) - EMI or latter known as PT EMI (Persero) is an established and experienced state-owned company in Indonesia, running business in conservation and energy management services. Based in Jakart, the Company has strong business competencies on Energy Conservation, Water Conservation, Environmental Conservation, and Renewable Energy. According to information found in the Company's website, PT EMI (Persero) was first established in 1987 and originally registered as PT Konservasi Energi Abadi (KONEBA). KONEBA is a joint venture between five state-owned fertilizer companies in Indonesia; PT Pupuk Sriwijaya (PUSRI), PT. Pupuk Iskandar Muda, PT Pupuk Kujang, PT Pupuk Kalimantan Timur (PKT) and PT Petrokimia Gresik. In 1993, KONEBA has officially operated as a state-owned company under the Government Regulation No 2 of 1993. The name of PT Energy Management Indonesia (Persero) officially established in 2006. Maximum age of 28 years old. Minimum Bachelor Degree (S1) in Mechanical Engineering (Energy Conservation related). Minimum 3 years of experience in the related field. Fresh graduate are welcome to apply. Advanced knowledge in various concept and method related with mechanical equipment. Familiar with relevant engineering and material standards. Expertise with mechanical engineering software will be an advantage. Fluent in English and Bahasa Indonesia. Good people skills/management and good interpersonal skill. Good problem solving skill, planning and controlling. Minimum Bachelor Degree (S1) in Electrical Engineering (Power). Advanced knowledge in various concept and method related with electrical equipment (low-medium voltage). Expertise with electrical engineering software will be an advantage. JobsCDC.com now available on android device. Download now on Google Play here. Please be aware of recruitment fraud. The entire stage of this selection process is free of charge. PT Energy Management Indonesia (Persero) - Fresh Graduate Engineer EMI February 2018 will never ask for fees or upfront payments for any purposes during the recruitment process such as transportation and accommodation.